There�s quite a lot of choice when it comes to compact battery powered guitar amplifiers. In order to help you narrow down your choice, we�re going to take a look at a great little update to the incredibly popular Micro Cube. The Roland Micro Cube GX certainly comes with more functionality, but is it a worthy successor to its predecessor? What are the pros and cons of the GX, how does it live up to its older relative? What do other users think of it? Who is it for? Being highly portable and compact, the Roland Micro Cube GX makes for a fantastic little practice amp. It is hugely popular with buskers, thanks to its durability. Considering it only has 3 watts of power (the original Micro Cube only had 2), it is surprisingly loud and some guitarists have reported using the amp with a full band. With on board effects plus amp modelling and up to 25 hours of playing time on 6 AA batteries, you can see the appeal. The tones kicked out by the GX are very versatile with the forceful sound produced being great for blues and rock. Whether you want a clean jazz sound or screaming metal distortion, this little Roland will deliver, thanks to the COSM amps provided. If you want a versatile little battery amp with plenty of features, the Roland Micro Cube GX won�t disappoint. The top panel is straightforward and easy to use, considering the level of functionality provided, and it�s easy to switch between the 8 COSM (Composite Object Sound Modeling) amp models. 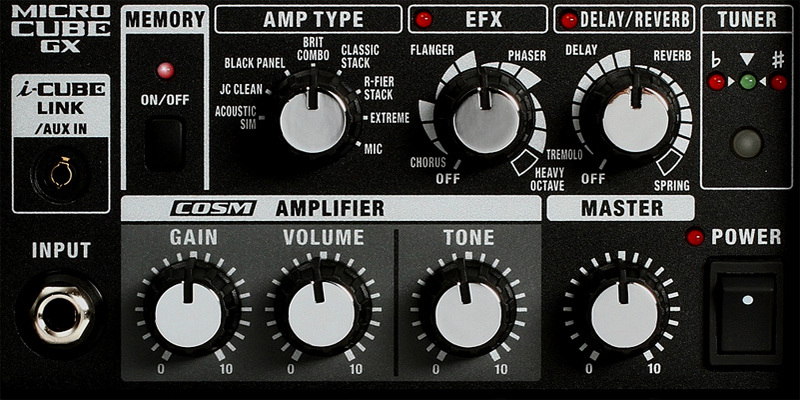 COSM is basically a form of Digital Signal Processing (DSP) that is used for emulating the sound of various amplifiers. You can read more about it here. Given the physical size of the GX, it�s surprising just how many features are included. Top Panel - Here we have the i-Cube link/ aux in, input, memory button, gain, volume, tone, COSM amp selector, EFX, delay / reverb control, master volume, chromatic tuner and power switch. 8 COSM Amps - One of the main features of the Micro Cube GX is the celebrated Composite Object Sound Modelling technology from Roland. There are 8 models to choose from, which makes this a very versatile little amplifier, allowing you to play various styles of music. Let�s look at some of the tones available. Extreme - Very high gain and deep distortion for blistering death metal style play! Digital Reverb & Delay - There's a separate control for reverb, spring reverb (not found on the Micro Cube) emulation and delay. Built In Chromatic Tuner - This is a useful feature but apparently it can be a bit frustrating to use. Memory Function - New to the GX is the memory function that enables you to store one of your favourite settings at the touch of a button. This gives the impression of a dual channel amp as you can switch between the saved setting and the standard mode. Digital Effects - Along with the reverb and delay, you also have chorus, flanger, phaser, tremolo and heavy octave effects built in. iCube Link - If you want to connect your iOS device (iPhone, iPad, iPod etc.) you can do so using this 3.5mm jack. You can also connect other music players or phones via this socket (Android devices and so on). There's a free app available (Cube Jam) for iOS which allows you to record and post produce using the Roland GX. Let�s take a look at some of the pros of the Micro Cube GX. There's an overwhelming amount of praise for this portable battery powered amplifier and the general opinion seems to be that this is a fun little amp loved by most guitar players out there. Users seem surprised at the huge sound that emanates from such a small box. It's a sturdy piece of kit with a great range of COSM amp models and built in effects. The simplicity of use and surprising depth of power and tonal quality make this a great little buy. Considering the cost (just over �100 at the time of writing), you get a lot of amp for your money. Most user reviews around the Internet actively recommend purchasing the Micro Cube GX. One customer even stated that it was almost the perfect practice amp! What are the cons of owning the GX? One of the main gripes with the Cube GX is the lack of an independent input jack for a mic. You can only connect a microphone or a guitar separately, which is a bit of a shame. Some users have reported that the tuner isn�t as accurate as they would like either. Also, even though this packs a great punch, it probably isn�t suitable for use with a full band. It is a practice amp though so isn�t really meant for that type of use. If you were paying big money (which you aren�t in terms of amplifier prices) you might expect a little more from some of the effects and overdrive settings. One reviewer thought the effects settings were a bit sensitive for example. On the whole though, this amp gets glowing reviews and the negative points are few and far between. It has to be said that the Micro Cube GX gets some of the best user reviews we�ve seen. There�s a heck of a lot going for this mighty little combo and it certainly delivers when it comes to both sound and value. The GX makes an ideal busking amp, whilst also being great for recording. It�s perfect for use in the home studio and for band practice sessions (provided you don�t have Keith Moon on the kit!). If you want a versatile little battery amp with plenty of features, the Roland Micro Cube GX won�t disappoint.